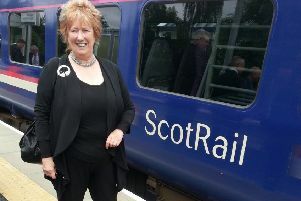 While campaigners who fought for a restoration of rail services linking the central Borders with Edinburgh are looking forward to trains running in September, rail champions in the east of the Borders are angry and disappointed at a fresh delay in improvements to the East Coast service. Rail Action Group East Scotland (RAGES) have met with Transport Scotland after being told that improvements planned for December 2016 won’t happen until December 2018. Pledges had included the re-opening of a station at Reston and better local services between Berwick and the capital. The Transport Minister’s office wrote to RAGES asking them to arrange a meeting with the Transport Scotland Rail Policy Team at Buchanan House, Glasgow, and that meeting took place last week when RAGES chairman and vice-chairman were joined by MSPs Iain Gray and Paul Wheelhouse, as well as local councillors. The policy team was told that there were many unhappy people in East Lothian, Berwickshire and Berwick when new Scot Rail franchise operators Abellio announced that the local service could not start in December 2016, the initial start date given by the Transport Minister. At the meeting there wasan in-depth discussion about putting planning and construction of East Linton and Reston stations back as close as possible to the original 2016 date. It was agreed that RAGES would write to Transport Scotland Rail Policy Team, for defined detail of the station planning at Reston and East Linton, through to opening, and that six-monthly meetings would take place at Buchanan House, so that RAGES was kept up to speed with developments.